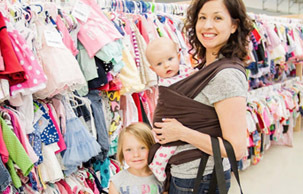 Join us for the resale savings event where thousands of local families get MORE for LESS! Download the Shopping Map to find just what you're looking for! Shop 40,000+ square feet of bargains! Everything is organized by size, gender and category. We'll give you a map, a shopping bag, and you can shop 'til you drop! April 12th | Opening Day! 9am - 9pm | $3 admission today only however you get in FREE by claiming ticket HERE. 8am - 5pm | Shop the restocked sales floor and enjoy FREE admission - no ticket needed! 7pm - 9pm | 50% Off Public Presale: $5/family paid admission. Purchase Ticket Here! April 14th | Half Price Day! 8am-3pm | Many items are an additional 50% off. Everyone welcome and admission is FREE - no ticket needed! The new home of the Just Between Friends Lower Bucks Sale is the SportsPlex at Warminster. Amazing finds and great prices!! I will return as a volunteer and shopper until my child has outgrown the items sold. Love love love this sale!! "Ease of drop off, making money, recycling in a positive fashion, clearing out my closets and playrooms, ease of pick-up, nice friendly people in administration, and nice friendly volunteers. "